Add our printable favor tags to your favors to say "Thank you" to your guests. These favor tags print 12 per page and are 2" squares. 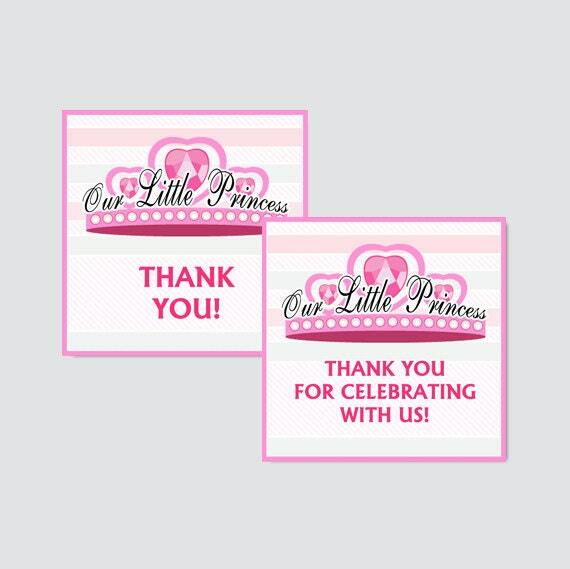 There are two wording phrases that you can choose from - "Thank You" or "Thank you for celebrating Our Little Princess." You get both files and can choose which to download and print. • Two separate PDF files with the two wording options. Each favor tag is a 2" square and they print 12 per page on an 8.5 x 11 sized PDF. • This item is for a digital file which means no printed items will be mailed to you. • The files will come as shown in the listing pictures. Because this item is an instant download, color and/or wording changes are not included. If you're interested in customization, see below. After you order you will be taken to a page on Etsy where you can download the files for your purchase. If for some reason you don’t get to download your files right after you order, you can always get to your ordered files by going to the “Purchases and Reviews” section under your account in Etsy. Just click on the download button beside the order and you’ll be able to save the files to your computer and then print. This listing is for digital files only. No physical items will be mailed. Because our products are digital, we do not offer refunds. We will make exceptions to this no-refund policy if there was an obvious mistake made on our part. We try to make sure our designs will print true to what you see in the listing pictures. However, since computer monitors vary the color printed may vary slightly from what you see on your computer screen. When you purchase this file you are licensed to use the digital product for personal or non-profit use only. You may not copy, reproduce, share, or transfer any of the files to a third-party. The graphics and designs are property of GreatLittleFavorCo and they cannot be reproduced or copied for any reason without our permission beforehand.